The road to my favorite place, Trillium Lake, was scheduled to close (according to the interwebz, so who really knows) today. So I made a point to go up and visit on Sunday. The leaves were just starting to change, and the lake was mirror still when I arrived. I went up with my Mom and son, and told Mom that I better get the reflective shots right then, because the wind could pick up at any time. Within 5 minutes of taking this shot, they in fact did and did not die down the entire time we were there. Very beautiful I must say. Timing is everything, a fine autumn photo it is. Isn't this the most magnificent season? 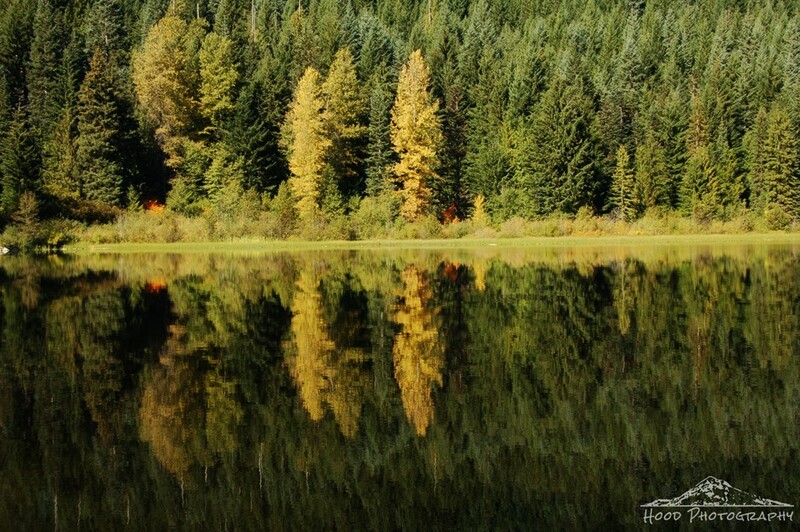 I love the reflections of autumn! What a beautiful perfect mirror image. I love the colors this time of year. Glad you could capture it before the winds disturbed the water. looks like a lovely, quiet place. This is a perfect reflection! Have a great week! I'm such a sucker for a good MIRROR shot! beautiful image Sarah... the wind has been quite active here too, it really is hit or miss with a photo op this time of year. Gorgeous reflections, - glad you were 'previous' with your picture taking before the wind rippled the water. Gee -- my goodness isn't that the truth -- great shot -- love those kinds of photos.. everything is STILL for the moment. Was so windy here too yesterday -- it's all in the timing. Beautiful shot! Perfect shot of the color of the season, which is my favorite. You picked a perfect spot. Reflections are so mesmerising, especially in autumn. Such very lovely colour tones and a beautiful reflection.